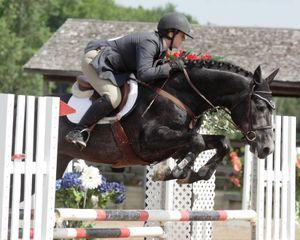 "Cora" was purchased in 2007 as a young jumper prospect and future broodmare. 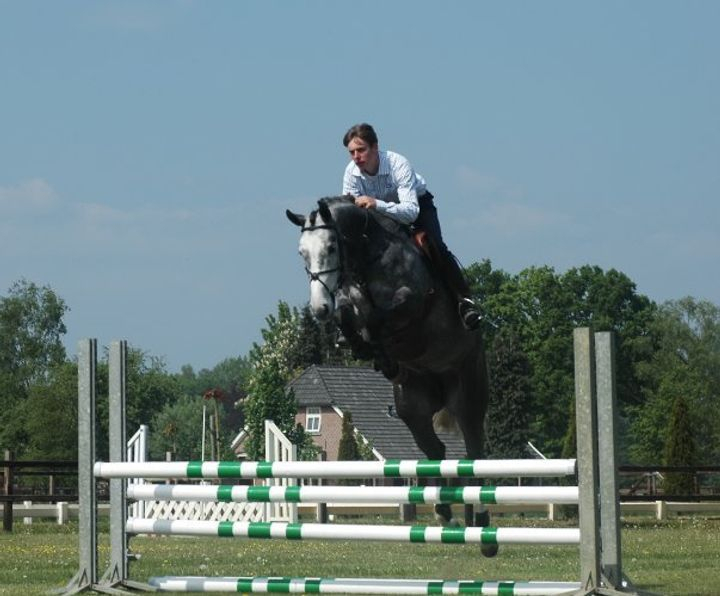 She is a lovely mare who has good conformation and an above average jumping ability. She jumps with a lot of scope and a superb technique! Before being brought to Canada, Cora spent a few months training in Europe. 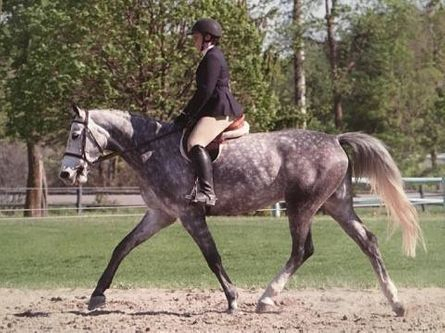 The video below shows her in the Spring 2007 as a 4yo just started under saddle. After a winter off to get settled in and used to Canada, life under saddle now begins for Cora. 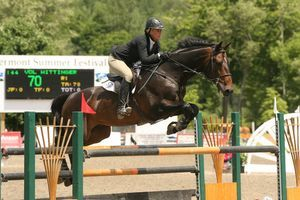 Cora spent the summer of 2008 showing in the 3' hunter divisions to gain the valuable mileage in the show ring that she needed in order to learn to control her massive jumping efforts. 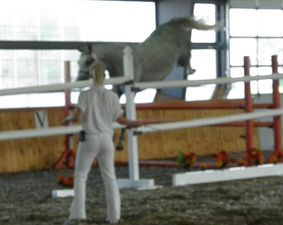 The heights certainly never posed a problem for her, it was working on keeping the rideability between the fences that caused the greatest amount of effort. The 2009 season began with a clinic with Jill Henselwood. Even with the cold winter weather, Cora was very good over the two days. She worked well through the grids and the various exercises. Shortly after starting the 2009 season, it was discovered that Cora was going to need some dental work and a little time off - so the decision was made to bred her. 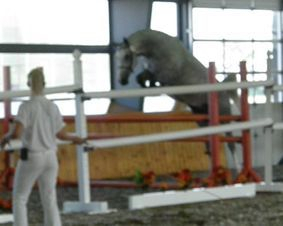 She was bred to the KWPN stallion Wittinger VDL (Indoctro x Nimmerdor x Nabuur) for a spring 2010 foal. 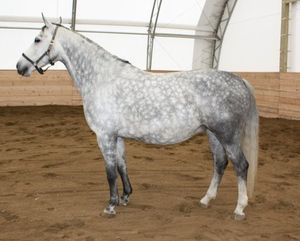 About 8 weeks before she was expected to deliver, Cora was moved from her training stable to one where she would be able to get the maximum turnout for her and her future foal. May 24 - He has arrived!! 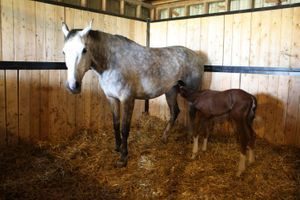 On May 24, Cora delivered a beautiful chestnut (grey) colt. He was named "Finnan" in honour of one of our tourist stops on our family visit to Scotland. On the particular day that Cora had been bred back in Canada, the family was visiting the Glenfinnan monuement. May Update: Unfortunately, Cora was kicked by another mare when she was returned to the mare paddock after being weaned from Finnan. The result was a fractured splint bone of the right hind leg. 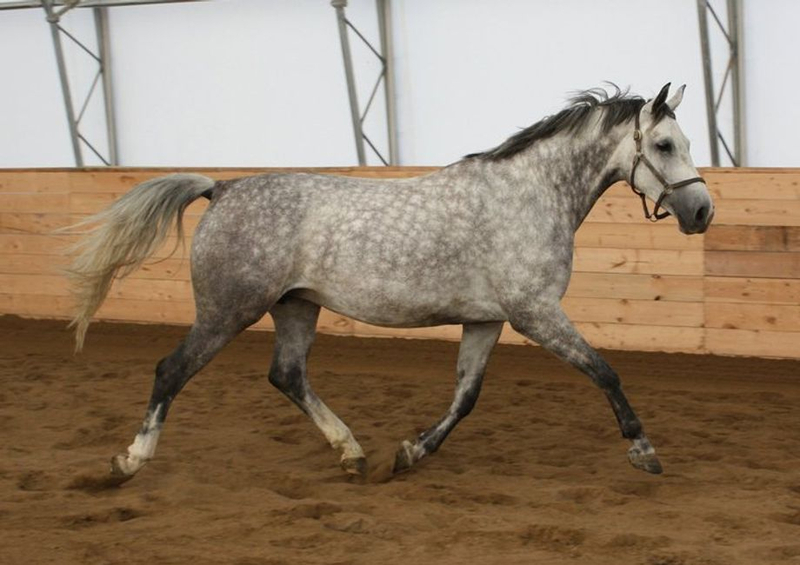 Although the break has healed and Cora shows no sign of lameness, the decision has been made to breed her this year to my own stallion Capi Rossi Frihave. CSHA Mare Inspection: Being presented at the KWPN-NA keuring has made Cora eligible for sight unseen approval with the CSHA. All the paperwork has been submitted and she was officially recorded for breeding purposes on April 11, 2011. Getting her approved as a broodmare with the CSHA now provides a registery for her 2012 foal!! 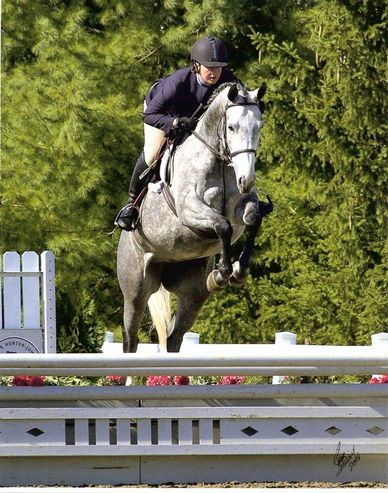 July Update: Requiring a collection while away at a horse show with Capi Rossi in Quebec, Cora now has a confirmed pregnancy with a late-May due date. 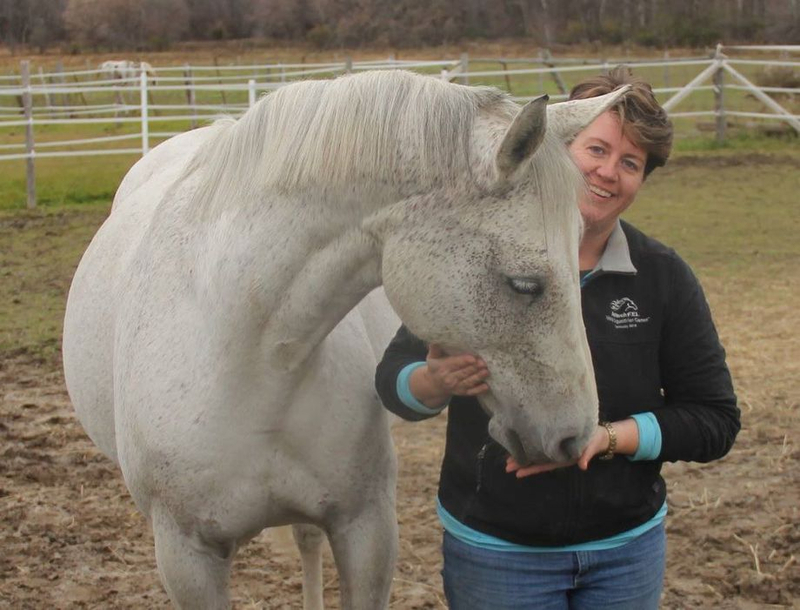 October Update: Over the 2011 Thanksgiving weekend, Cora was moved to a breeding farm in Kemptville where she is happily enjoying her broodmare status. May 17, 2012 - SHE'S HERE!! 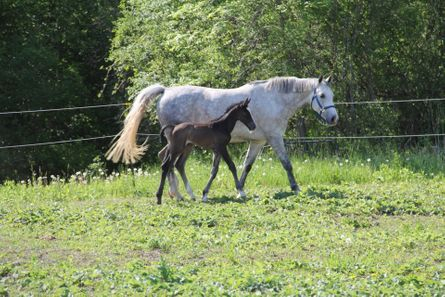 On the evening of May 17th, Cora presented us with a lovely tall leggy grey filly by Capi. Although she is to be registered with the CSHA, we are sticking to the KWPN naming conventions for this year - the filly will be named HAVEN. 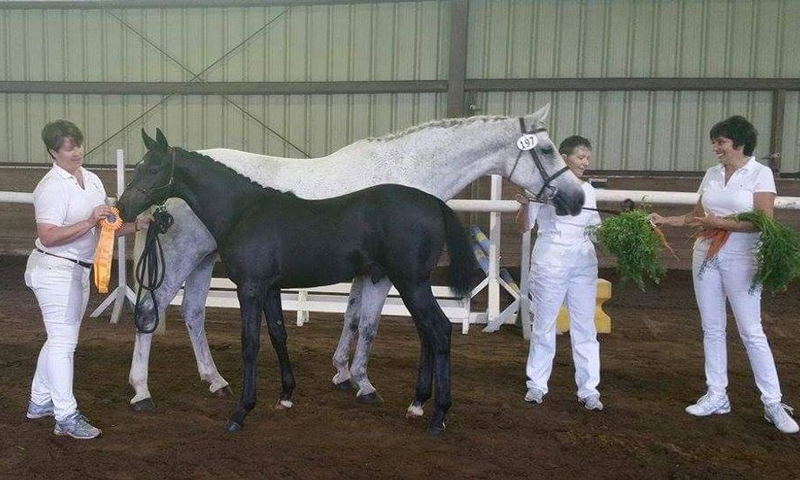 June Update: The young stallion Brugal VDL (Indorado x Guidam x Notaris) - pictured at left - has been selected as this years breeding pairing. Covered late in the month of June, Cora should be due late May/early June 2013. Although the odds are against me, I am secretly hoping for Cora's first non-grey offspring... 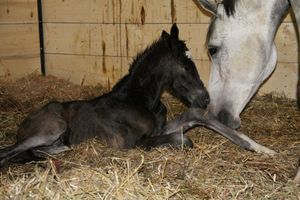 This foal shall be registered with the KWPN-NA and I believe it to be the first Brugal foal expected in North America. May Update: Large and round and past 340 days, Cora is patiently waiting for dinner while the rest of us are not so patiently waiting for the arrival of her Brugal foal. June Update: Sadly, I must report that Cora was found open today (June 17th), so I will try another breeding with Brugal and hope that we have the safe arrival of a healthy foal next year ... With a later breeding date than I would normally like, I figure it is better to try an attempt or two instead of just leaving her open; however, I will also be happy to have an early start next year at breeding should she not take. October Update: Unfortunately Cora is open for this 2013 breeding season. However, this does allow us an early start at breeding next year! Luckily she is going to be a turn out buddy for her young daughter Haven - otherwise I might be tempted to put her back under saddle for the winter. December Update: In order to get an early start on next years breeding, we took a biopsy for Cora. 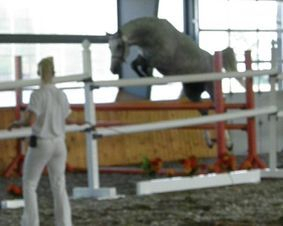 She is scored as a Grade IIa... now just to plan out if we try Brugal again or switch to a different stallion? For now, Cora can just enjoy the winter turnout with Haven and the other mares. It is incredible to believe that at just over 1.5 years of age that Haven is already as tall as her mother - If the string tests are to be believed, Haven should finish around 16.3hh! May 11: Our first breeding attempt of the season once again goes to Brugal. This is our last remaining frozen dose. Cora was covered on Mother's Day, so we hope to have a little black dot on the ultrasound in two weeks time. May 27: Unfortunately, we were unsuccessful. There is no pregnancy to report from this breeding, so we are going to switch our stallion choice for the next breeding attempt. 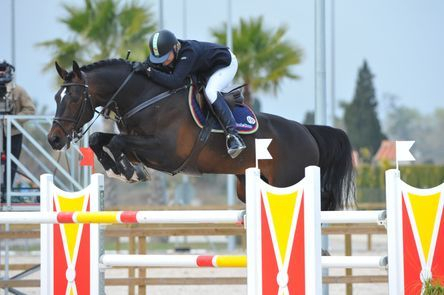 June 01: Cora was bred to the wonderful Zapatero VDL (Chin Chin x Ircolando). Now the two week wait begins!! Hopefully we will have better luck with this stallion as he is known to have pregnancies via frozen here in North America. June 17: Happy to report a black dot on today's ultrasound! August 05: Cora had her final ultrasound today. At day 65, everything looks happy, healthy and progressing as it should. December 14: Haven has rejoined the herd for the winter! Cora is now into her sixth month of pregnancy and has a good sized belly to show for it. May 07 2015: At 340 days gestation - it's a Boy! Cora decided it was finally time to foal and did so around 3am. I am happy that I brought Cora to the vets to foal, as Kiernan need a little assistance with his arrival - presenting with a mild shoulder-lock. Once safely on the ground everything progressed as one would normally expect. Both Cora and Kiernan are happy and healthy!! Cora and Kiernan are back home on the farm after their stay at the vet clinic. It was wonderful to see them out and moving in the big grass field!! 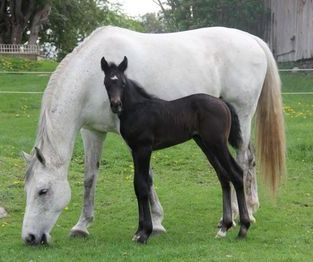 Yet again Cora has been an excellent mother to her colt Kiernan. She is patient, yet firm and seems happy to share the attention with each visit. Sadly, we were not successful in out attempt to breed her with the great Chin Chin this year. Again the hard decision has been made to leave her open at this late point in the season and try again early next spring. Kiernan takes a first premium ribbon and overall 6th place in the keuring tour. 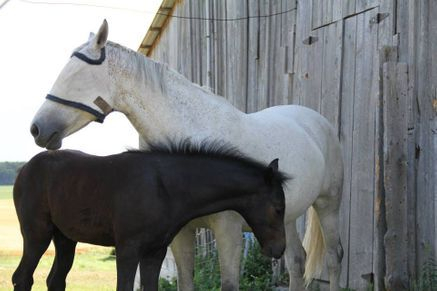 It is never an easy decision to let a good mare go, but we felt that with Cora being open and still owning three of her offspring that the time had come to let her move on to a new home. She has been sold to a young breeder in Texas, and we certainly hope that Cora continues to produce in her new home.